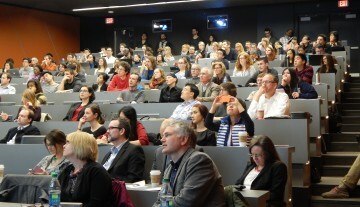 Last week, UBC’s Neglected Global Diseases Initiative at UBC (NGDI-UBC) in partnership with the Vancouver Coastal Health Research Institute and The Centre for Drug Research and Development (CDRD), Canada’s national not-for-profit drug development and commercialization centre, brought together leading researchers from across the country to discuss Ebola Treatment and Action. The meeting focused on Canada’s current contributions to potential therapeutics in response to the 2014 West African outbreak of Ebola Virus Disease (EVD) and the opinions of Canadian Public Health officials and researchers for the prevention, and control of infection domestically. NGDI-UBC is currently working closely with CDRD to identify how best to use the extensive capabilities of its biologics platform to employ a novel approach to developing the next generation of therapeutic monoclonal antibodies for the prevention and treatment of Ebola; bringing its industry partners, and combined 40-plus years of therapeutic antibody development experience in rapidly developing candidate antibodies with enhanced effector functions to the table. Dr. Bonnie Henry, Deputy Provincial Health Officer, BC Ministry of Health and Associate Professor, School of Population and Public Health, Faculty of Medicine UBC opened the symposium with a detailed overview of the symptoms, transmission and mortality of EVD. To-date, 14,000 people have been infected with Ebola in the current outbreak which came to light in March 2014, but is thought to have originated in late 2013. From a public health perspective, Canada is well prepared to deal with patients who may present with symptoms and subsequently test positive for EVD. A Special Advisory Committee is in place, consisting of Public Health Experts from across the nation in addition to a BC Provincial Task Force on-hand to advise best practices if and when suspected cases arise. From a treatment perspective, there are three Canadian contributions that are being fast-tracked through clinical trials but the challenge remains to find companies and researchers willing to translate their EVD research from bench to bedside. The keynote speakers focused on two of these contributions; the National Microbiology Laboratory’s therapeutic monoclonal antibody, ZMapp and Tekmira Pharmaceutical’s TKM-Ebola lipid nanoparticle (LNP) therapeutic. Dr. Xiangguo Qiu of the National Microbiology Laboratory (NML), Public Health Agency of Canada said that the challenges associated with controlling the spread of the current outbreak are multi-factorial. Firstly, this outbreak occurred outside the traditional “hotspot” of Eastern Africa and therefore, local communities were poorly prepared for this event. This lack of preparedness and understanding has culminated in community resistance to foreign health workers and a local underestimation of the problem. Additionally, there is increased travel by West Africans and a greater number of inexperienced medical staff combating this outbreak. The NML is responding in a three-pronged approach; they have set up a mobile diagnostic lab which has been based in Sierra Leone since June 2014; they have produced a vaccine with the vesicular stomatitis virus (VSV) vector and they have developed a monoclonal antibody (mAb) therapeutic. The VSV vaccine induces strong B- and T-cell responses. This vaccine has been tested as a post-exposure therapeutic and has been shown to provide 100% protection 28 days post-immunization. This vaccine is currently in Phase I trials and 1,000 doses have been donated for use in the current outbreak. Over the past 10 years, the NML has also been developing a mAb which targets Ebola virus glycoprotein (EBOV GP 1.2). This is the primary protein involved in the pathogenesis of EVD. It is produced using a hybridoma model followed by humanization of purified mAbs. ZMAb is a cocktail of these mAbs which was observed to be 100% efficacious in a study using rhesus monkeys. ZMapp; the chimeric combination of ZMAb also showed very high survival rates in in vivo models. Both have been used in the treatment of 9 Ebola patients during the current outbreak. Five out of 7 patients treated with ZMapp survived while both patients treated with ZMAb survived. Dr. Ian MacLachlan, Executive Vice President and Chief Technical Officer of Vancouver-based Tekmira Pharmaceuticals spoke about their siRNA-based LNP therapeutic targeting the Kikwit strain of Ebola. These LNP formulations are highly uniform and highly stable. The siRNA targets V24, VP35 and LPol genes on the Ebola virus. The lyophilized formulation has shown increased potency and increased therapeutic index and appears to ameliorate pathology due to EVD such as coagulopathy. The Tekmira product has been used to treat an undisclosed number of patients in the current outbreak. There is ongoing development of this product to account for mismatched sequences between LPol and VP35 in the current strain. However, the LNP platform has allowed Tekmira to rapidly adjust the product configuration in response to the emergent virus. By bringing Canada’s vast health research resources to bear, we as a nation are already making a major global impact on this devastating disease, and by further fostering dialogue and collaboration, and sharing knowledge and resources, we now aim to amplify both our national efforts and impact. The Neglected Global Diseases Initiative at UBC brings together the technical expertise and perspectives of a variety of disciplines at UBC – including bench science, pharmaceutical and health research, business, social policy, and law – to develop interventions for neglected global diseases and ensure their delivery to those in need. For more information, visit www.ngdi.ubc.ca.